In this article, the process of installing and uninstalling the plug-in in InDesign is described. The Elvis InDesign plug-in (also known as the Elvis InDesign client) is a plug-in that connects InDesign and InDesign Server to Elvis Server. This makes it possible to open layouts that are stored in Elvis, to place files from Elvis onto the layout, to save changes made in InDesign back to Elvis, and more. 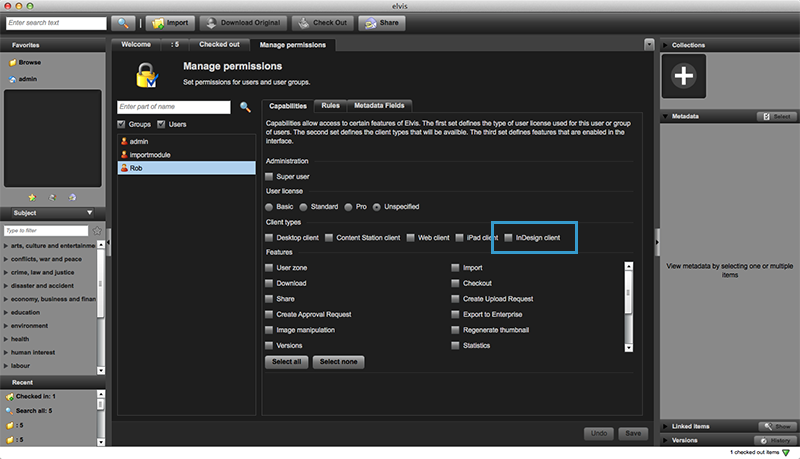 Each InDesign instance requires a separate user license. For details, see Elvis 5 license types. Different installation steps exist depending on the version of the plug-in that you want to install. Info: This version is provided as part of Elvis Server 5.23 or higher. Step 1. Download the installer from the Client Install page of Elvis 5 Server. 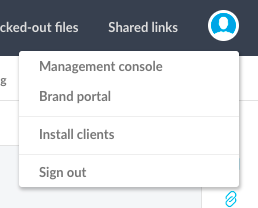 From the Avatar menu in the Pro client, choose Install clients. 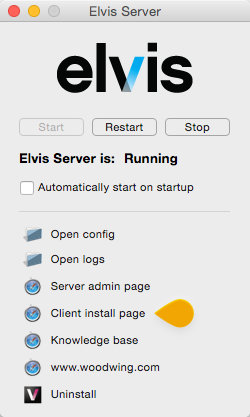 Access the Elvis Server launcher and click Client install page. Step 2. Unzip the downloaded file, run the installer and follow the steps onscreen. From the Avatar menu in the Pro client, choose Install clients (requires Elvis 5.21 or higher). Step 3. Wait until the process is completed and then close the window. 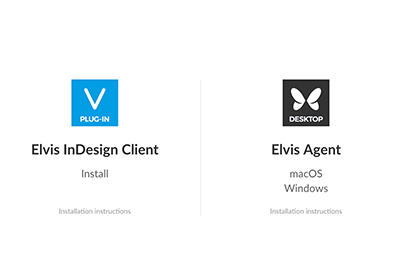 For Elvis 5.0.61 and higher: Launch the Client Install page from the Elvis Server launch panel, click the icon for the Elvis InDesign client plug-in and save the file. 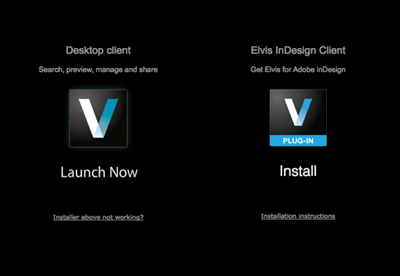 Figure: The Client install page option on the Elvis Server launch panel (left) and the Elvis InDesign client option on the Client Install page (right). For Elvis 5.0.60: Contact WoodWing Support. Step 2. Double-click the downloaded file. The Adobe Extension Manager will launch and will automatically install the plug-in. Step 4. (Optional, only when upgrading from a previous version of the plug-in) Verify that the new version has been installed by checking the About Elvis Plug-ins... dialog. The user needs to be given permission to use the Elvis InDesign client. For more information about Capabilities, see Controlling user access to clients and client features in Elvis 5. 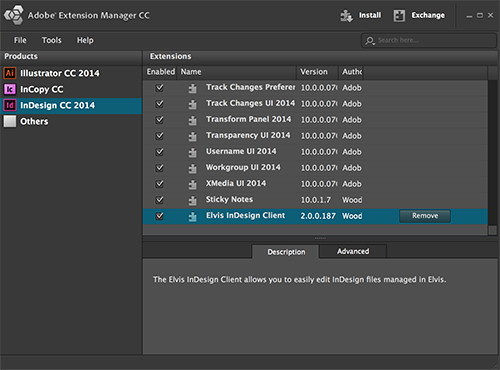 Make sure to assign sufficient licenses in Elvis Server for using the Elvis InDesign client. An "Elvis" entry to the main menu. It contains options for connecting to and working with Elvis. For the InDesign client version 3.2 and higher, the menu also contains a Help option for accessing the documentation on the WoodWing Help Center. Figure: The "Elvis" menu contains options for connecting to and working with Elvis. Elvis Path. The path of the linked file on Elvis Server. Elvis ID. The Elvis ID of the linked file. Elvis Url. The URL to the Elvis object of the linked file. Figure: The Elvis options in the Links Panel Options dialog. Figure: The Links panel with Elvis options shown in the Link Info pane. 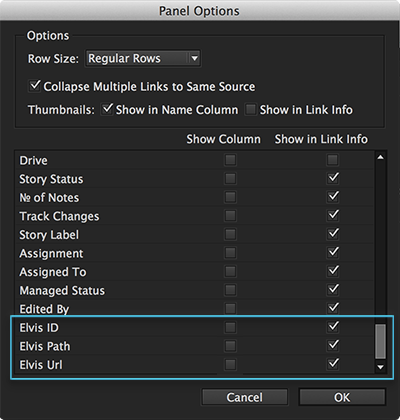 An About Elvis Plug-ins... option in the InDesign menu (on MacOS) or Help menu (on Windows). This will display which version of the Elvis InDesign client plug-in is installed. To uninstall the files that were installed during the installation of the plug-in, follow the steps as outlined below. Various versions of the Elvis InDesign client exist, each with their own process for uninstalling the software. In the InDesign menu (on Mac OS X) or Help menu (on Windows), choose About Elvis Plug-ins... . Depending on your version of the software installed, follow the steps as outlined below. Run the Elvis InDesign client installer and choose to uninstall the software. (MacOS only) From the InDesign folder, run the file named 'Uninstall Elvis InDesign plug-ins.app'. (Windows only) Uninstall 'Elvis InDesign' by using the Windows 'Add/remove programs' feature. An uninstaller can be used for uninstalling the plug-ins. This uninstaller is part of the download package for the Elvis InDesign client. Step 1. 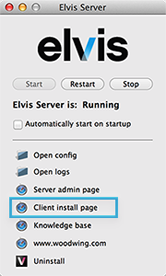 Download the package from the Client Install page of Elvis 5 Server. The process will take a few moments to complete. Step 1. Access the Adobe Extension Manager for your version of InDesign. Step 2. In the list of products, choose InDesign. Step 3. 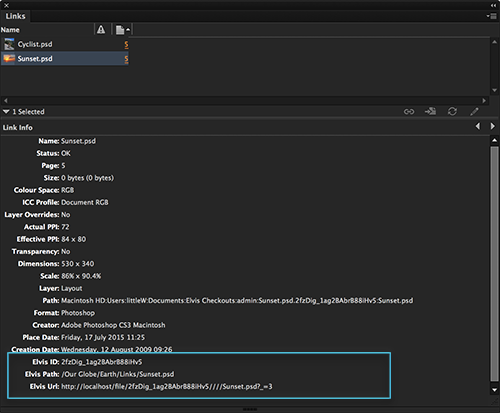 In the list of extensions, select the 'Elvis InDesign client' extension and click 'Remove'. Confirm that you want to remove the extension. 22 November 2018: Renamed article from 'Installing the Elvis InDesign client for Elvis 6'. 22 November 2018: Updated section 'Installed components' with a list of files that are installed during installation. 22 November 2018: Added section 'Uninstalling the plug-in'.